Originally designed for farmhouses (hence their common name as the farmhouse sink), their large size and unmatched durability made them perfect for the tough jobs required of a kitchen sink on a family farm. 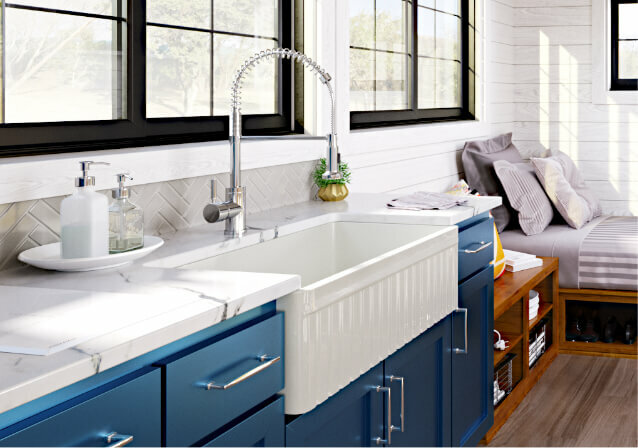 Farmhouse sinks have regained popularity in recent years, as homeowners spend more time in the kitchen entertaining. For larger families who spend a lot of time in the kitchen, the size and shape of an apron sink can be much more convenient and comfortable. Constructed from ceramic clay and minerals, our high-quality fireclay sinks are especially resistant to scratches, stains, and heat. Similar to the way porcelain is made, fireclay is molded and then fired at extremely high temperatures. This technique makes it hard as a rock and resilient to its everyday use. The MR Direct fireclay apron sinks come in 3 convenient sizes ranging from 24 to 33 inches wide. Single and double bowl options are available, each providing ample space at 10 inches deep. Each model is reversible, featuring a smooth or fluted design which gives you flexibility in your style and installation. The upkeep and maintenance of fireclay sinks is very manageable. Because of their non-porous, stain- and scratch-resistant surface, clean up involves a simple wipe down. When necessary, detergent or a mild non-abrasive cleaner can be used to scrub away at any kitchen residues. If well-maintained, these superior quality sinks will last a lifetime. If you are looking for sink that offers a sophisticated design, but can handle a high traffic kitchen, then we highly recommend a fireclay sink.